I was talking with someone about cooking the other day, and we both agreed that we did not like having people in the kitchen with us when we cooked. I realized as I was nodding sympathetically that I had made a plan with my friend Valerie to do exactly that the very next day. Rather than grab a coffee somewhere, I thought it would be fun if we got together and made something that I could write about here. I hadn’t included any Panamanian recipes until now so Val was supposed to consult her aunts for suggestions, and I was going to get everything ready so that when she got here we could whip something up quickly. We decided to make carimañolas, mashed yuca formed into a roll then stuffed with picadillo and deep fried, a popular breakfast and afternoon snack in Panama similar to the croquetas de yuca that I have when I’m home. An easy afternoon of catching-up, photographing my food, and turning Panamanian street food into an appetizers-for-lunch meal. I’d only been to Panama once when I was about 6 years old and had a vague recollection of the trip or the food. I do remember being fascinated by the mosaic in the hotel pool and being bought a new dress for a party. We went to a friend’s house where the slightly older girls of the family were fascinated to have a live doll to play with for a few hours. I remember the fun of getting ready for the party – a cloud of baby powder and perfume – and then nothing else. Exhausted from the swimming and the makeover, I slept through the entire thing. When I woke up and realized I’d missed it, I cried my heart out. It was my first party dress and my first party disaster. My ladies-who-make-lunch party didn’t didn’t go any smoother. I had planned to to have everything under way but was running late, so when she got there (also late), I had only just started boiling the yuca. I thought it would take a few minutes to mash the yuca, but we’d let the it cool too much (probably talking) so that it hardened and took much longer to push through the food mill. The picadillo was quick by we bickered over how to form the fritters – Val thought I was being too stingy with the filling (which I was) and I thought she was being too messy (which she was). In between squabbles, requests for Val to scold my dogs in Mandarin which she speaks fluently, and endless cranks of the food mill, the sun was sinking and late lunch was becoming early dinner. I realized that part of the reason I resist help (or witnesses) in the kitchen is that it interferes with the Barefoot Contessa episode I have playing in my head. From the moment I invite anyone over, I can see myself pulling together perfectly prepped ingredients to make a fabulous meal without getting so much as a spot on my crisply ironed, french blue button-down while my good friend Miguel creates a gorgeous table setting in the next room of my spacious, well lit East Hamptons home. Unfortunately, my kitchen is no where near the Hamptons and is only considered “big for New York”, I should wear a hazmat suit in the kitchen, and the only Miguel I know is my cousin who lives in London, works in finance, and has no interest in flower arranging (that I’m aware of). Typically, my imperfectly planned Panamanian afternoon ended with us splattered, tired, and tearing into our hard won carimañolas like wolverines in aprons. I don’t know that I actually set the table, much less arrange it in any special way. It wasn’t an elegant afternoon but it was fun and we made a plan for plantain empanadas in the next couple of weeks. I’ll never give up my quest for perfect because I just can’t, but I have to admit that making a mess with your friends has its own charms. Usually, when I’m making picadillo, I try to balance the sweet and savory. For this version, I was happy to leave out the raisins and throw in the chili peppers. While Panamanian cuisine isn’t nearly as hot as Mexican, they seem to add a little more heat than the rest of the Caribbean. Perhaps because they weren’t technically the Cuban croquetas de yuca I was used to, I tried a few things with this recipe I usually stayed away from like tomato paste and hot sauce. Nothing too scandalous, just a way to concentrate the flavors of the picadillo. 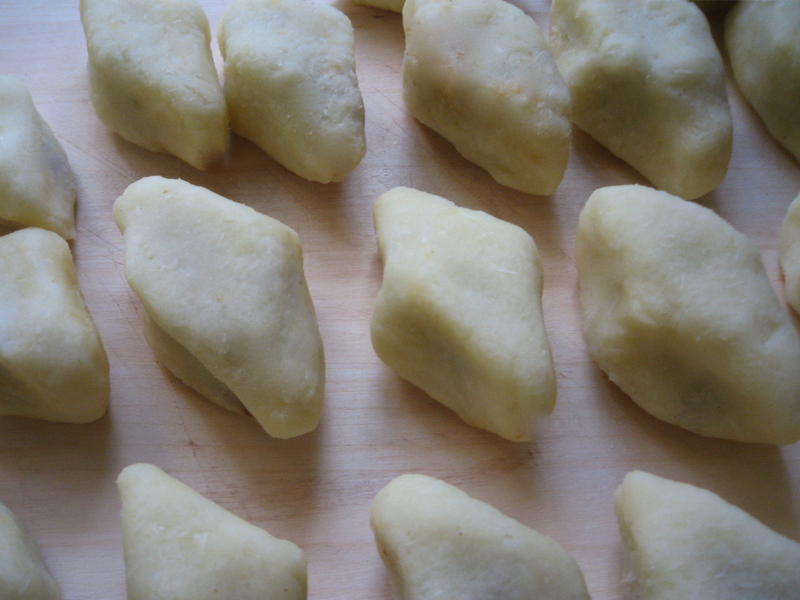 In an earlier version, I added eggs and a flour to the yuca to form a dough similar to gnocchi or buñuelos. 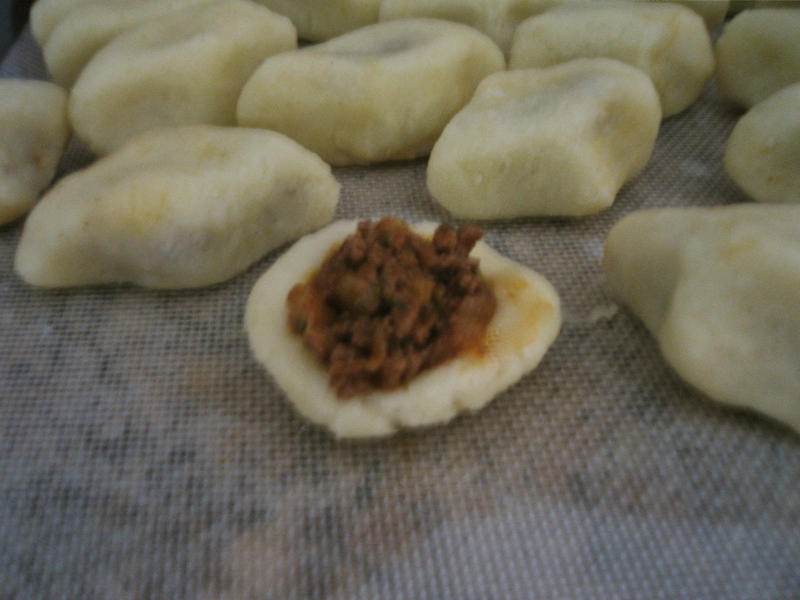 It formed a smooth but bland dough that overwhelmed the picadillo. The next time around, I added only a small amount of oil and salt which worked much better. Once fried, the yuca formed a crisp outer crust around a creamier inner layer that enveloped the spicy picadillo without overwhelming it. It was a great combination. Place yuca in a large heavy pot with enough cold water to cover by two inches. Add about 2 tablespoons of salt and bring to a boil over medium-high heat. Adjust heat to maintain a gentle simmer and cook the yuca until it’s tender but not too soft, about 15-20 minutes. While still hot, remove yuca with a slotted spoon or tongs and run through a food mill or place in a bowl and mash with a potato masher. * The yuca will become more difficult to process as it cools so reserve a small amount of the cooking water to add to the yuca by the spoonful as needed. Blend in one tablespoons of oil and one tablespoon of salt. Form into a smooth but stiff mass and set aside. Heat the oil in a large skillet over medium heat. Add the onions and pepper and sauté about 3 minutes until translucent. Add the garlic and sauté an additional 2 minutes. Add the beef and break it up so there are no lumps. Add the tomato paste, wine, Worcestershire sauce, oregano, cumin, sugar, salt and pepper and simmer covered over medium heat for 15-20 minutes, stirring occasionally until mostly dry. Blend in one teaspoon of hot sauce or more if desired. Add capers and parsley and adjust the seasoning. 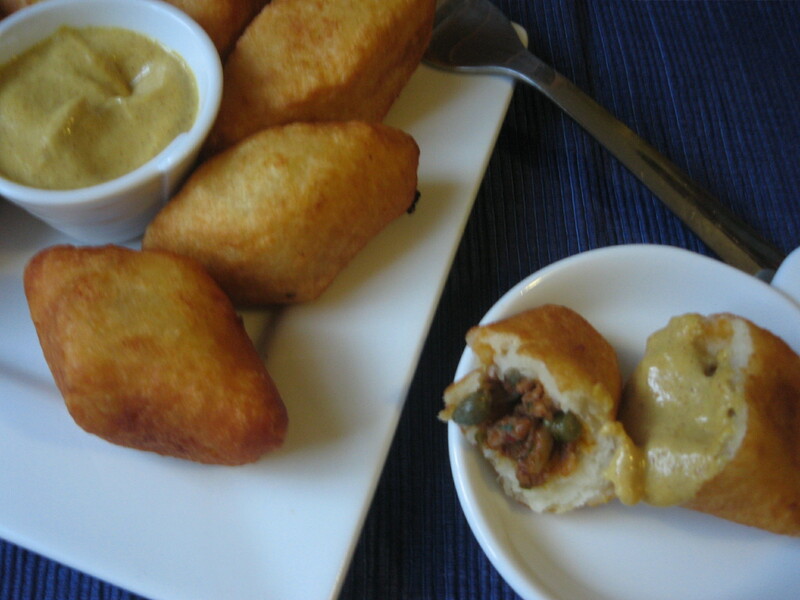 Divide yuca dough into 20-25 individual pieces rolled into 1 1/2-2″ balls. Create a well in the center of each ball and fill with one tablespoon of picadillo. To form the carimañolas, gently push the filling into the center as you close dough around it forming a diamond shaped fritter. Repeat with the remaining dough balls. In a deep fryer or heavy pot (3 1/2-4 quarts wide), heat oil to 375 degrees. Carefully add to oil 2-3 carimañolas at a time and fry until golden, turning occasionally, about 3-4 minutes total. Drain directly on cooling rack placed over lined baking sheet or on paper towels. 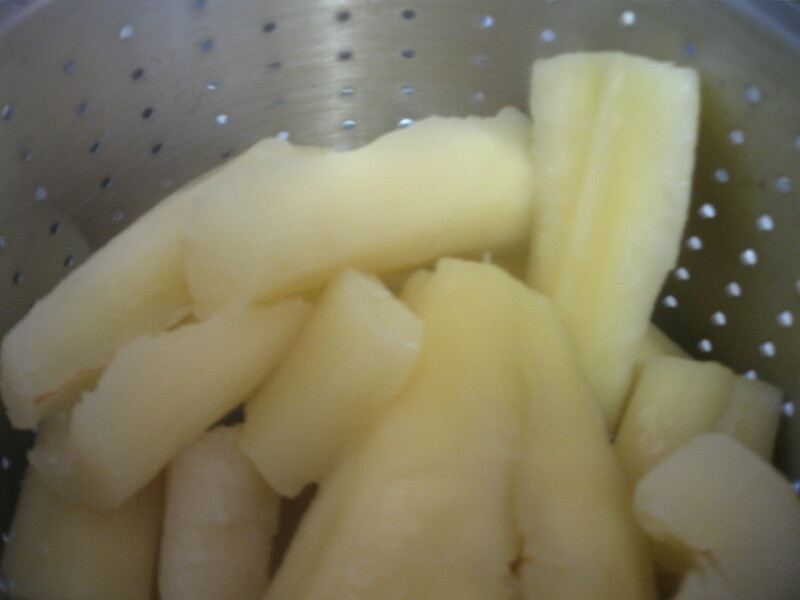 *If you are using a potato masher, remove the stringy fibers from the core of the yuca before mashing. Note – If you would like to save them for later, lightly sprinkle the freshly formed carimañolas with flour and place in a baking sheet in the freezer for about 30 minutes. Remove from the freezer and store in a ziploc bag until ready to fry. 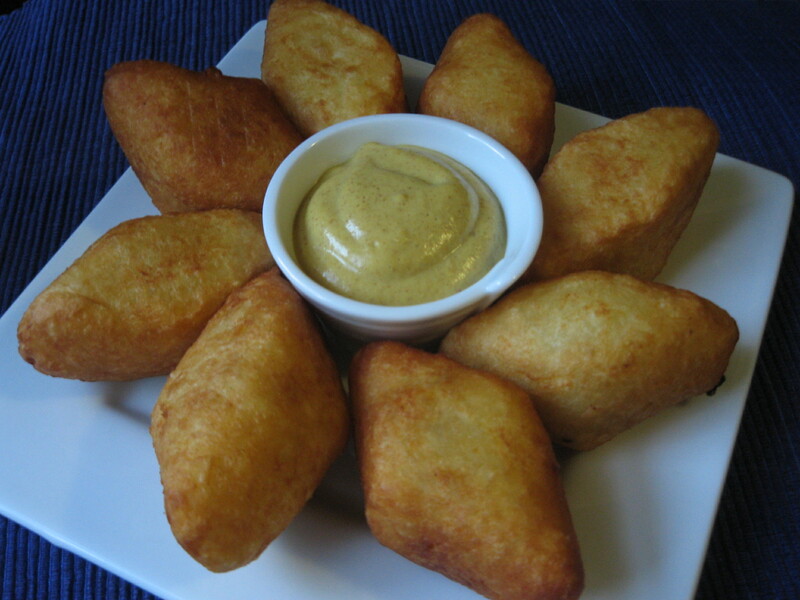 I’m a Panamanian living in DC…..and I do remember the smell of the carimañolas cooking….They are sooo goood!!!!! Easy fill method… roll the yucca into a ball and then form a “bowl” to place the filling. After you place the filling in the bowl you simple close the sides together to seal the yucca dough. It will form that pointed oval shape of the Carimañola. WHAT’S THE DIP IN THE MIDDLE??? The Carimanolas recipe sounds great. I hope you will forgive me for saying so, but I do think that you have misspelled ‘Panamanian’ in your title above. I am from Panama and have never seen it spelled the way that you have it ‘ ‘Panimanian’. I have already shared this particular article and recipe to FB in the past, but did not notice the error at that time. You have a very excellent archive of recipes here and I can tell that you are a very talented Chef. I did not think that you would want to leave this error in place. Thank you for your blog/website.